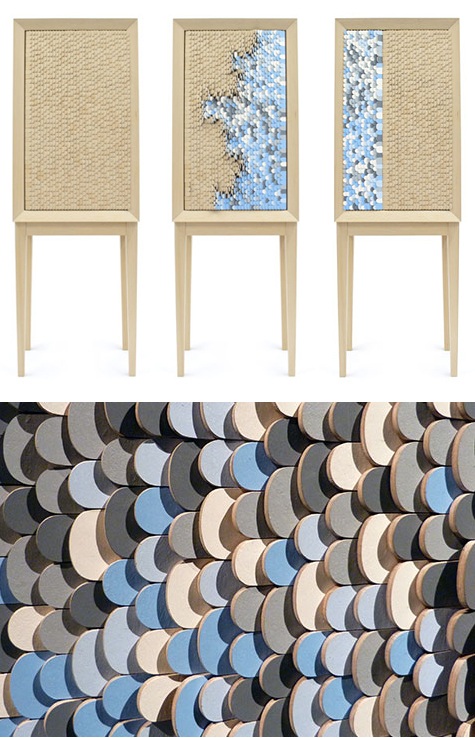 Dear Disaster Cabinet by Jenny Ekdahl consists of more than 2,000 small veneered and painted wooden parts that each can be individually flipped, and it was inspired by the idea that creating images and graphs might aid a psychological recovery process. "Dear disaster cabinet is aiming to facilitate a process of recovery after natural disasters for the user to reconcile and regain trust in nature. The moveable structure is meant to give an outlet through which the user can express his emotions and personality and on which he can leave his own individual imprint. The patterns are based on water and waves, creating a tactile and rhythmic interaction with ever-changing images and underlying meanings."